The Your Feed page has been updated and it now has three tabs, including a news tab and a glance tab. Recently, Microsoft had listed the new features that it is bringing with the Windows 10 October Update. It launched a new app called Your Phone that gives users instant access to their Android phone’s photos and texts on their computers. The company also rolled out another Android-centric update - Microsoft Launcher 5.0 for Android, that brings the new Your Feed UI and Timeline support. 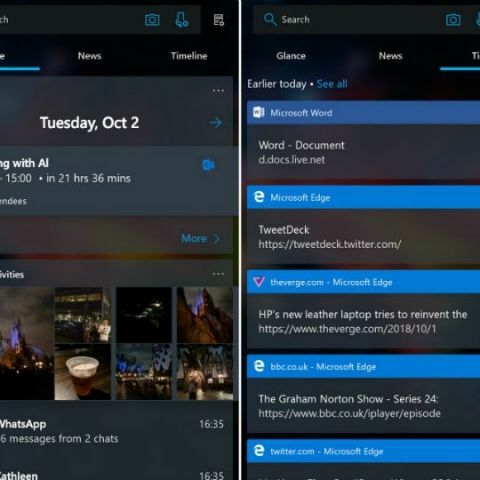 Your Feed is Microsoft's version of Google Feed and has been split into three tabs: Glance, News, and Timeline. Earlier this year, Microsoft had announced that it would be bringing these features to Android. Microsoft Launcher 5.0 is now available for beta testing. When signed into the same Microsoft Account on your PC and phone, the Timeline activity will sync across devices. So if you are working on an important document and you have to rush to some other place, Microsoft has got you covered. According to Android Central, with a single tap on your Android phone, you can jump to the same point where you left off. For this, you need to have the same set of apps installed on both your phone and on the PC. If you browse with Edge on PC, the activity will show up in the Android phone’s Timeline, and vice-versa. The News tab is now more expansive and gives users more customisation tools. You can select favourite topics to filter out news related to subjects that you are not interested in. The new Glance tab is reportedly the old Feed page, but with a much cleaner UI. Users can add custom widgets to it and reorganise the whole window on preference basis. Currently available in beta, the update is expected to be rolled out to Android devices soon. For iOS users, the Timeline support will be seen within the Microsoft Edge app as beta in the next month or two.